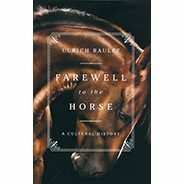 A very quick post to share the happy news that my translation of Farewell to the Horse: A Cultural History by Ulrich Raulff has been shortlisted for this year’s Helen and Kurt Wolff Translation Prize. This is the first time a translation of mine has made it onto a shortlist, so it’s a great honour and deeply gratifying. I confess I haven’t read the others on the shortlist but the longlist included Navid Kermani’s Wonder Beyond Belief, translated by Tony Crawford (winner of this year’s Schlegel-Tieck Prize), and one I had secretly hoped to translate myself: Stephan Orth’s Couchsurfing in Iran (translated by Jamie McIntosh).